Colombia’s second city is fast shedding its controversial reputation. With infrastructure projects that are bringing architecturally exciting libraries and parks to impoverished neighborhoods, and creative methods of transportation, Medellín is one of the most progressive cities in Latin America. Its situation — set in the Aburrá Valley, surrounded by green mountains — is ideal, its weather springlike year-round, and its people outgoing and proud of their city. A wave of construction is going on in most neighborhoods, which are bedecked with posters proclaiming the government’s dedication to innovation and education. After years as the center of Pablo Escobar’s drug operation and decades of related violence, the “city of eternal spring” is looking to the future. Get a sense of how far Medellín has come with a visit to the two-year-old Museo Casa de la Memoria (free). A sleek oblong, it is just one of the new, visually compelling buildings that are popping up all over the city — and often appearing somewhat incongruous in neighborhoods that have looked the same for decades. While many of the exhibits dedicated to Colombia’s years of civil war between the government (and its paramilitary groups) and leftist guerrillas are artistic rather than explanatory, there’s a timeline that’s useful for putting events in perspective. Riveting videos from victims and relatives of the desaparecidos (victims of the armed conflict who were “disappeared” over the years) offer powerful, firsthand accounts of what it was like to live in the middle of Colombia’s internal war. From the museum, walk down Calle 52, a chaotic street packed with trinket vendors, food carts and hole-in-the-wall empanada shops, to Hatoviejo, a long-established restaurant serving typical paisa cuisine (paisas are people from the Antioquia region, of which Medellín is a part). Order the hearty mondongo, a traditional tripe soup that comes with rice, avocado and a plantain (25,900 pesos, or $11.30 at 2,290 pesos to the dollar). Then stroll over to Plaza Botero, a beautiful square filled with the distinctively pudgy bronze statues of dogs, people and horses created by Colombia’s best-known artist, Fernando Botero (more of his work can be found in the Museo de Antioquia on the plaza). The eye-catching black-and-white Gothic building in the center of the plaza houses the Palacio de la Cultura Rafael Uribe Uribe (free and worth a peek for its art gallery and historical artifacts). Craft beers are gaining traction in Colombia and you can sample them at Cervecería Libre, a cheerfully unpretentious operation that sits behind sliding garage doors in the up-and-coming Ciudad del Rio neighborhood. The owners brew their own stout, IPA and more in the back, but at the bar they also serve craft beers from three other Colombian microbreweries: Apóstol, Bogotá Beer Company and 3 Cordilleras (beers, 5,000 to 6,500 pesos). Pull up a stool for a chat with the bartenders, who will order you a taxi when you’re ready to go. 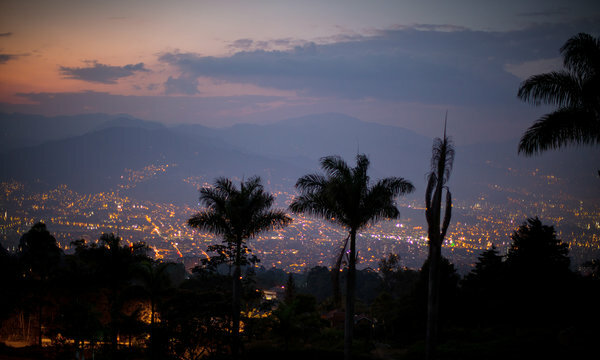 Medellín is set in the Aburrá Valley. One of the most compelling signs of Medellín’s renaissance is the Metrocable — a public transportation system of airborne gondolas that cruise up the hillside like ski lifts. Hop on at Acevedo station (2,000 pesos; you can transfer from the aboveground Metro, Colombia’s only subway system) and sail up the mountain over brick houses with corrugated metal roofs. Transfer at Santo Domingo and get on the second leg (4,600 pesos each way), a 15-minute ride during which the city recedes, ending in Parque Arví, 4,350 acres that feel surprisingly rural, down to the men on horseback or leading their cows. There are extensive walking trails among the pine and eucalyptus trees; after exploring, hop back on the Metrocable to Santo Domingo Savio, a colorful shantytown that’s now home to the Biblioteca España — three giant black slate monoliths designed by the Bogotá architect Giancarlo Mazzanti. The library (one of a growing number) is free and open to all and has become a center for a community that once lived in the middle of a war zone. An exhibition at Museo de Arte Moderno, in a former factory. Head to Envigado, a municipality adjacent to Medellín’s El Poblado district, for a lunchtime stop at La Gloria de Gloria, a casual corner restaurant that serves up some of the best chicharrón in, quite possibly, the world. These crispy strips of pork rind are deep fried and served with hearty helpings of rice, beans, chorizo, plantain and more, in a bandeja paisa — the Colombian dish that keeps field workers full all day (32,000 pesos per plate, which is enough for two). The eponymous Doña Gloria often comes around with a bottle of aguardiente, Colombia’s throat-burning anise-flavored national liquor, pouring shots for everyone — including herself — but order a pitcher of the lemonade as well to help wash it down. 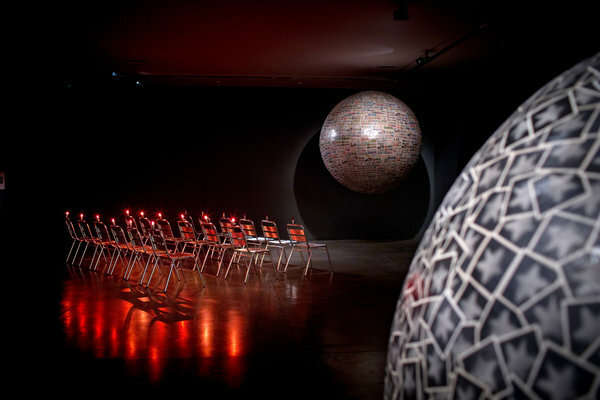 Stop by the beautiful Museo de Arte Moderno, a compact, industrial-chic space that presents exhibitions, which change every quarter, by contemporary artists like Álvaro Barrios. Occupying a former steel factory, the museum (8,000 pesos) is getting a new addition, designed by the Peruvian architects 51+1, that will house a permanent collection of mostly Colombian artists, including Beatriz González. The gift shop is a good place to pick up Medellín souvenirs, like small notebooks with illustrations of the Metrocable by the Colombian artist Marcela Restrepo (2,000 pesos). It’s surprisingly difficult to find good coffee in Colombia (most of the best is exported), and locals usually drink tinto — a weak brew of inferior beans. A few new cafes are trying to change this, though, and the charge is being led by Pergamino. This chic cafe by Parque Lleras, which uses single-origin beans from coffee plantations owned by the same family, wouldn’t be out of place in San Francisco, with MacBook-toting trendsetters filling the patio seats. After refueling, wander down Via Primavera and nearby Via Provenza; both are lined with boutiques and restaurants. Stop at Vida Augusta, which sells international and Colombian-made housewares and gifts, like wooden eyeglass frames from Lignum. The area around the park hovers between lively and tacky, but stopping for a pre-dinner drink on the rooftop bar at the Charlee Hotel is worth it, if only to enjoy views of both the pool and the pulsing streets below. Cross Calle 10 to reach Carmen, a perennial favorite. The elegant three-part restaurant (upstairs, downstairs and a gorgeous garden) lures the city’s coolest crowds with its elaborate meals created by the husband-and-wife team Carmen Angel and Rob Pevitts, who trained at Le Cordon Bleu in San Francisco. Each dish, like shrimp poached in butter infused with lulo, a local citrus fruit, is a mélange of careful detail (even the tonic is house-made). Book well in advance. Dinner for two, about 350,000 pesos. A stop at one of the city’s numerous, high-energy salsa bars is an essential component of any visit. Son Havana is a Cuban-themed salsa joint in the trendy Laureles neighborhood, with a nine (or more) member band playing on Thursday and Saturday nights (admission, 10,000). Couples of all ages dance on the dance floor, by the bathrooms and in the aisles. It’s a small place and not fancy, but the atmosphere is electric, the music is sparkling and the dance skills are mesmerizing. Settle in with an Aguila beer (4,000) and prepare to stare. Though evidence of Medellín’s bright future is everywhere, it’s still fascinating to get up close to the drug czar Pablo Escobar. Camilo Uribe, owner of Medellín City Tours (medellincitytours.com), drives visitors to the three Escobar landmarks ($95 for one person; rates drop for more). First is the upscale cemetery where Mr. Escobar is buried and where people still leave flowers (he remains a folk hero to some of the city’s poor). The cemetery has views of the city and surrounding mountains. See also the rooftop on which Mr. Escobar was shot by police snipers while trying to escape on Dec. 2, 1993. His penthouse is fascinating: a crumbling building with an enormous, antiquated satellite dish in the back. Some scenes from “Escobar: El Patrón del Mal,” a popular 2012 Colombian telenovela, were shot outside. Mr. Escobar’s personal elevator is no longer working, but if you walk up to the huge apartment you can step into his private safe, the size of a walk-in closet. End your trip with an experience that’s exhilarating and inspiring. One of the city’s most forward-thinking infrastructure investments was the creation of outdoor escalators that run up the steep hillside leading to Comuna 13, a gang-plagued neighborhood formerly isolated by its position atop stairs equivalent to a 28-story building. The impoverished area has been revitalized by the 1,259 feet of escalators, which cut commuting times and enabled elderly and disabled residents, some of whom never left home, to go much farther afield. Take the escalators (staffed by security guards, many from the neighborhood) to the top, where you’ll have excellent views of the city, as well as the riot of primary colors and murals that were added to the buildings when the escalators opened. Facing boisterous Parque Lleras, the Charlee Hotel (Calle 9A, No. 37-16;thecharlee.com; from $200 ) is the city’s top boutique hotel, with plush rooms and a gym where you can spot Colombia’s top models posing for selfies between workouts. Near the Charlee but in a much more peaceful part of the neighborhood is the Diez Hotel (Calle 10A, No. 34-11; diezhotel.com; from 259,000 pesos, or $114, with breakfast). Each floor’s décor references a different region of Colombia; the spa looks out over the city.